Preheat oven to 350 degrees F. Line baking sheets with parchment paper or Sil-Pat. In a large bowl, beat together butter, sugar, and brown sugar for 1 to 2 minutes until lightened and fluffy. Add eggs and vanilla; mix until combined and smooth. Add flour mixture to butter mixture in two additions. Mix until just combined after each addition. Mix in pretzels and white chocolate chips. Stir in sprinkles by hand. 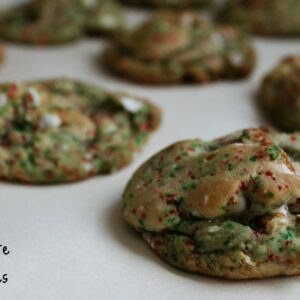 Drop cookie dough by the tablespoonful onto prepared baking sheets. Bake for 10 minutes or until cookies just being to brown around the edges. If you choose to use sanding sugar instead of nonpareils (or similar sprinkles), add only 1/4 cup with 2 parts red to 1 part green.